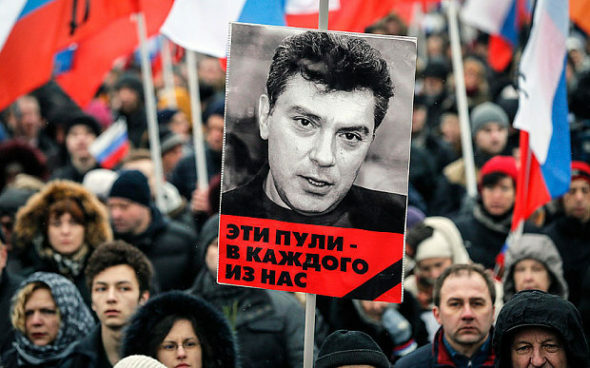 A portrait of Kremlin critic Boris Nemtsov, is seen during a march to commemorate him in central Moscow. MOSCOW | Boris Nemtsov, a vociferous public critic of Vladimir Putin, was gunned down on Friday night in what appears to have been a highly professional assassination. Cameras overlooking the murder scene on the Bolshoi Moskvoretsky bridge could have provided crucial evidence including identifying the killer and the getaway vehicle, as well as further details of how the attack was planned. But Moscow’s Kommersant newspaper reported on Monday that key cameras on the bridge, in a heavily policed area of Moscow just outside the Kremlin, happened to have been switched off for “repair work” on the night of the killing. Kommersant also reported Anna Duritskaya, Mr. Nemtsov’s girlfriend and the key witness in the crime, was so shocked by the attack that she was unable to identify the model of the getaway car. footage to emerge has been a low-quality, long distance video from a camera to the south of the river. That footage suggests that a killer was lurking on a stairwell off the bridge in a well planned and tightly coordinated assassination. A getaway car pulls up to collect the killer as soon as the deed is committed, indicating tight co-ordination and a high degree of planning. But the crucial moment of the killing itself is obscured by a passing snow-clearing vehicle. The revelation came as John Kerry, US secretary of state, met Sergei Lavrov, the Russian foreign minister, at a UN human rights forum in Geneva. The pair were due to discuss the investigation into Mr. Nemtsov’s death as well as ongoing differences over the war in Ukraine. The U.S. has called for a full and transparent investigation into Mr. Nemtsov’s murder. 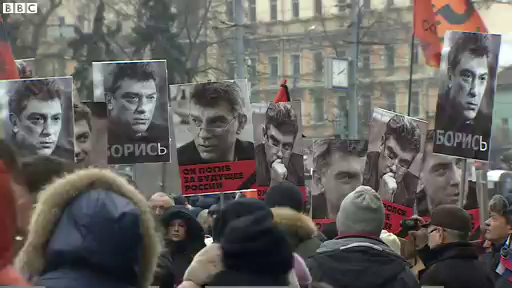 Russians protest murder of Vladimir Putin opponent Boris Nemtsov. Up to 70,000 people marched through central Moscow to pay respects to Mr. Nemtsov on Sunday, in the largest opposition gathering in the Russian capital since a series of anti-Kremlin demonstrations in 2012. [Nemtsov was gunned down shortly before midnight Friday as he walked across a bridge near the Kremlin. The killing came just hours after a radio interview in which he denounced Putin’s “mad, aggressive policy” in Ukraine. At the time of his death, Nemtsov was working on a report that he believed proved that Russian troops were fighting alongside the separatists in Ukraine, despite the official denials. Mr. Nemtsov will be buried on Tuesday at Moscow’s Troyekurovskoye cemetery. ISLAMABAD | In one of the world’s largest – and fastest – efforts to collect biometric information, Pakistan has ordered cellphone users to verify their identities through fingerprints for a national database being compiled to curb terrorism. If they don’t, their service will be shut off, an unthinkable option for many after a dozen years of explosive growth in cellphone usage here. 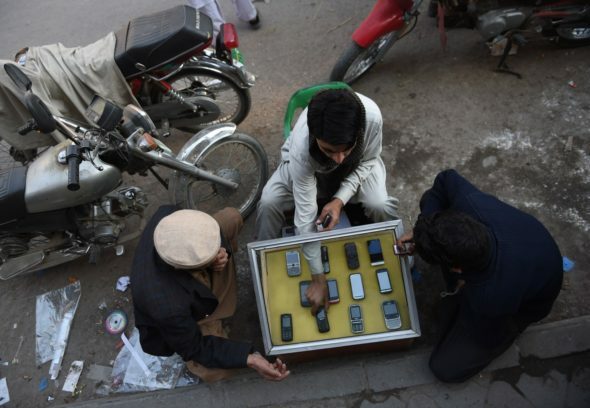 A Pakistani mobile vendor deals with customers at his roadside stall in Rawalpindi on Jan. 6. Prompted by concerns about a proliferation of illegal and untraceable SIM cards, the directive is the most visible step so far in Pakistan’s efforts to restore law and order after Taliban militants killed 150 students and teachers at a school in December. Officials said the six terrorists who stormed the school in Peshawar were using cellphones registered to one woman who had no obvious connection to the attackers. But the effort to match one person to each cellphone number involves a jaw-dropping amount of work. At the start of this year, there were 103 million SIM cards in Pakistan – roughly the number of the adult population – that officials were not sure were valid or properly registered. And mobile companies have until April 15 to verify the owners of all of the cards, which are tiny chips in cellphones that carry a subscriber’s personal security and identity information. In the past six weeks, 53 million SIMs belonging to 38 million residents have been verified through biometric screening, officials said. …With 50 million more SIM cards left to be verified, phone companies are dispatching outreach teams deep into the countryside and mountains to notify customers of the policy. Cellphone owners’ fingerprints are being matched with those on file in a national database the government began creating in 2005. Those whose prints are not in the database must first submit them to the National Database & Registration Authority. Some residents, including several million Afghan refugees not eligible for citizenship, also have to obtain a court affidavit attesting they will properly use their cellphones. Over the years, several countries, including South Africa and India, have implemented broad systems for obtaining and storing residents’ biometric information. But analysts and communications experts say they can’t recall a country trying to gather biometrics as rapidly as Pakistan is doing. “In a country like this, where the infrastructure is not available in many areas, this looks unprecedented,” said Wahaj us Siraj, the chief executive officer of Nayatel, a major Pakistani Internet supplier. Once the nationwide verification process is complete, police and intelligence officials will have a much easier time tracing the origins of crimes or terrorist attacks, said Ammar Jaffri, the former deputy director of Pakistan’s Federal Investigation Agency. Jaffri noted that cellphones have often been used to detonate explosive devices in Pakistan. Authorities are also struggling to curb extortion carried out by criminals, often affiliated with banned militant groups, who make threatening phone calls demanding money. The first train to complete a journey on the world’s longest railway line, connecting Spain and China, has returned home. 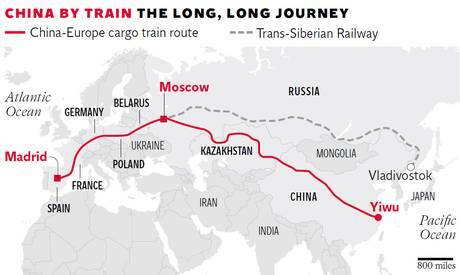 The 16,156-mile round trip on the new Yixin’ou cargo line through China, Kazakhstan, Belarus, Poland, Germany, France and Spain took four months. The train arrived laden with cheap goods and returned to China with expensive olive oil. 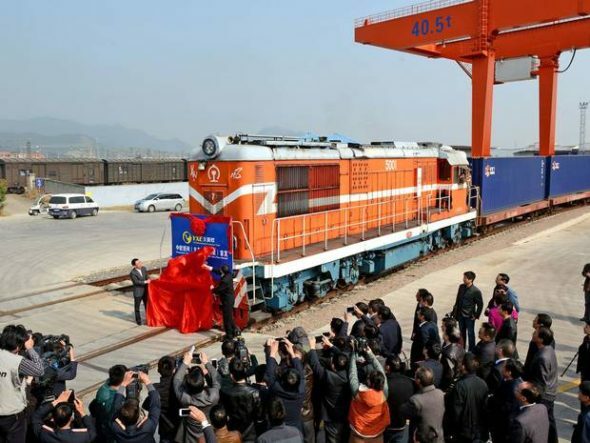 The 82-container cargo train began its journey in November in the eastern Chinese city of Yiwu. Packed full of Christmas trinkets and decorations, stationery and craft products, it arrived in Madrid on 14 December, in time for the thousands of small shops and Christmas markets to stock up on the cheap Chinese goods. Before the Yixin’ou line was opened, goods traded between Europe and China depended on inefficient sea or air transport, meaning higher prices in Europe. “The cargo train will boost economic exchange between Yiwu, the world’s largest small commodity market, and Madrid, Europe’s largest small commodity market,” said Li Huihuan, manager of Yiwu CF International Logistics, which operates the train. The train returned to Yiwu last weekend, carrying olive oil and other Spanish-made goods that are becoming popular in an increasingly affluent China. 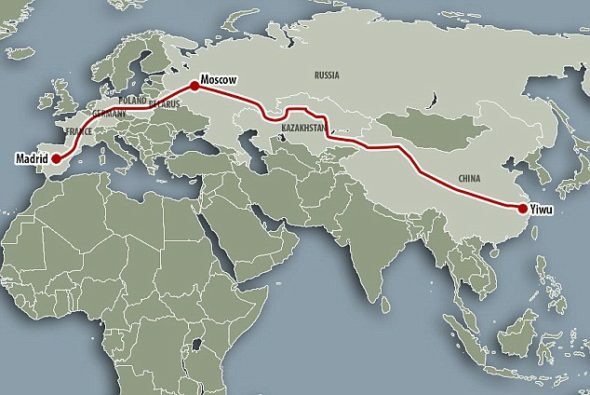 The line is 450 miles longer than the previous record holder, the Trans-Siberian Railway, which connects Vladivostok in the east of Russia, to Moscow. State media in Russia greeted the opening of the Yixin’ou by pointing out that containers on the new line must be changed three times during the journey from China to Spain, because tracks in the seven countries are of different gauges. Nonetheless, the line’s supporters hope that it will boost trade between the EU and China, which already stands at more than €1bn a day. Traders at both ends of the new track point out that the train provides a vastly faster service than seaborne goods and is substantially cheaper than air cargo. Yiwu, a city of 1.2 million, is a booming example of modern China. The city’s small commodities market is growing at an exponential rate and in 2014 combined imports and exports were valued at $23.7bn, a 28.6 per cent increase on the previous 12 months. According to the Chinese-state run news agency, Xinhua, 60 per cent of the world’s Christmas trinkets are originally bought and sold in Yiwu’s annual Christmas market. While traders in Madrid’s Plaza Mayor and elsewhere will welcome the opening of the Yixin’ou railway, which should see the prices they pay for nativity scenes and Christmas lights fall, Yiwu is also famous for being the center of the world’s illegal counterfeiting industry. b) The bridge where Mr. Nemtsov was assassinated was in a heavily policed area of Moscow near the Kremlin. Why isn’t there any CCTV footage of the scene at the time of the murder? c) Ask a parent: do you think Russian President Vladimir Putin is responsible for Boris Nemstov’s death? b) Why is the government taking this step? c) What repercussions do cell phone owners face if they do not comply with this requirement? d) What does the government acknowledge about this requirement? What reasoning do they use for why citizens should comply? e) If our federal government made such a requirement, would you support it as a way to possibly prevent terrorism? Explain your answer. Then ask a parent and a grandparent the same question. b) What are the benefits of this train vs. air or sea transport between China and Spain? c) What else is the Chinese small commodity market city of Yiwu (the world’s largest) well-known for? 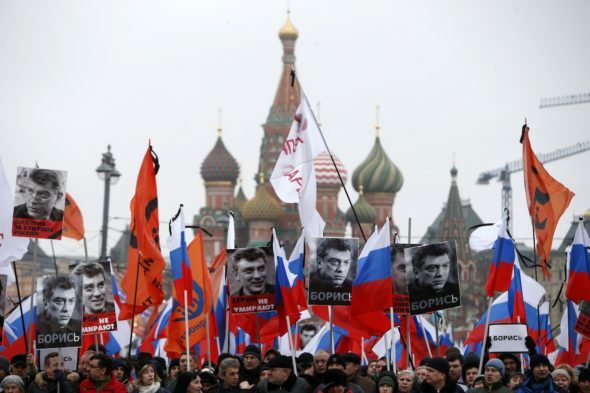 While the killing of Boris Nemtsov has shaken the Russian opposition, which sees the Kremlin as responsible, it is unclear whether his death will be enough to invigorate the beleaguered movement. Despite the Ukraine conflict and Russia’s economic crisis, support for President Vladimir Putin has been above 80 percent in the past year. Since mass anti-Putin protests brought hundreds of thousands to the streets of Moscow in 2011 and 2012, Putin has marginalized and intimidated his political opponents, jailing some, driving others into exile, and ramping up fines and potential jail time for those detained at protests. The 55-year-old Nemtsov was among the few prominent opposition figures who refused to be cowed. But while many at the march expressed respect for his long political career and grief at his loss, few believed that his death would spark major change in Russia because of the Kremlin’s control over national television, where a vast majority of Russians get their news. The Kremlin had identified Nemtsov as among the leaders of a “fifth column,” painting him and other opposition figures as traitors in the service of a hostile West. 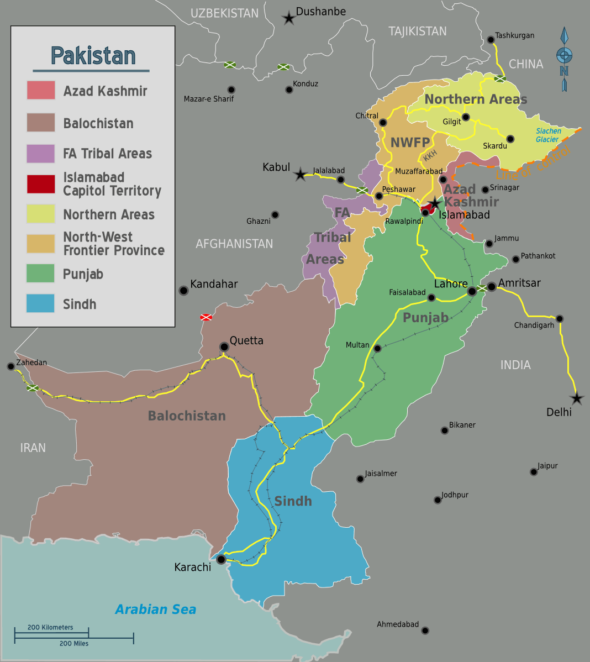 As Pakistan’s decade-long struggle against Islamist extremism has stretched on, residents have grown accustomed to hassles such as long security lines and police checkpoints. Now they must add the inconvenience of rushing into a retail store to keep their phones on. Though Pakistan’s first cellphone company launched in 1991, there was only sparse usage until the turn of the 21st century. Since then, the number of cellphone subscribers has grown from about 5 million in 2003 to about 136 million today, according to the Pakistan Telecommunications Authority. The mobile phone subscription rate now stands at about 73 percent, roughly equal to the rate in neighboring India, according to the World Bank. It’s even common for Pakistanis in remote or mountainous areas, where electricity can be sporadic and few have access to vehicles, to own a cellphone. As they show up at cellphone stores, some Pakistanis are learning firsthand just how lax Pakistan had been in tracking SIM cards. Ghulam Rasool, a 24-year-old Afghan citizen living here, waited in line only to learn that the SIM card he had bought at a fruit market four years ago was now illegal. “Before, no one asked, but now they are, and it has to be in my name,” said Rasool, who emerged from the Mobilink office with a new phone number. “Everyone has my old number, and now I have to contact hundreds of people” in both Pakistan and Afghanistan. Still, many Pakistanis are taking the process in stride, saying they are willing to do whatever it takes to reduce terrorism. They are skeptical, however, that this will be the answer to ending a war that has killed more than 50,000 Pakistani residents and soldiers over the past 13 years.